Frederick O. Brooks and Godfried Dold. Silversmith and watchmaker. 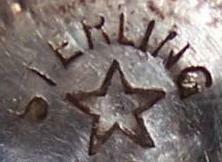 Appointed by Abraham Lincoln as the Chief Coiner of the U.S. Mint 1861-1863. Sperry Douglas Brower and son Walter S. Brower. Maker and retailer of coin and sterling flatware. George B. Brown and John Burgis Kirby. Succeeded by the John B. Kirby Co. In the partnership of Sullivan & Brown with Enoch Sullivan in 1814. In the partnership of Brown & Kirby with John B. Kirby 1834-1857. Operated as R. Brown & Son 1849-1852. Robert J. Brown, Robert Somerby, and Charles Brown. Brackett, Crosby & Brown 1849-1850. Crosby & Brown with Samuel Crosby 1851-1852. Jones, Ball & Poor 1853-1855. Jones, Shreve & Brown 1855-1858. Shreve, Brown & Co. 1858-1863. Successor to Baldwin & Co. Became Thomas G. Brown & Sons in 1881 when Brown's sons Thomas B. and William A. were added to the firm. Was in the partnership of Brown & Anderson c. 1850-1871. 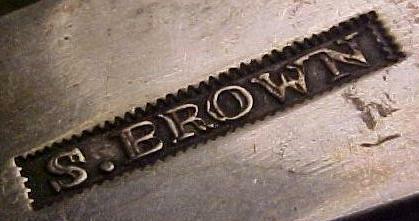 After Brown's death in 1872, his business was renamed T.W. Brown & Sons. Liberty Browne and William Seal. 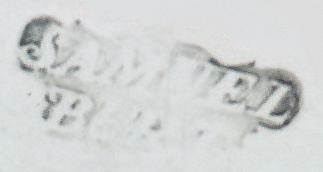 Was in the partnerships of Browne & Houlton with John Houlton in 1799 and Brown & Seal 1810-1813. 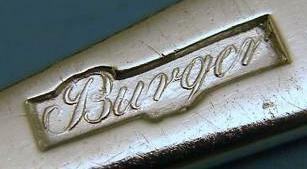 Listed in directories 1877-1879 as a silversmith and as a manufacturing jeweler in later years. Frances A. Bunnell and Andrew B. Schreuder. In the partnerships of Ufford & Burdick with Thomas Ufford 1813-1814 and later Burdick & Burritt 1816-1819. In the partnership of Burger & Prichard c. 1775. Worked with Myer Myers 1779-1783. Charles A. Burnett and John E. Rigden. In the partnership of Burnett & Rigden 1796-1806. Was in partnership of C.A. 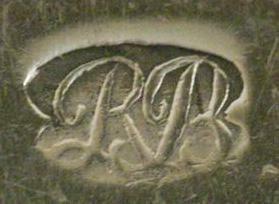 Burr & Co. 1857-1863. Silversmith and jeweler. Was in the partnership of E. & W. Burr with William Burr 1792-1810 and later in the partnership of Burr & Lee with Samuel W. Lee 1815-1819. Joseph Burritt and son Joseph C. Burritt. In the firms of J.M. Freeman & Co. 1843-1844 and Burwell & Winship 1854-1856. Silversmith, watchmaker, jeweler, and early photographer. Franklin Butler and Edward McCarty. Succeeded by Butler, McCarty & Co.
Franklin Butler, Edward McCarty and Henry O. Hulburt. In the partnership of James Byrne & Co. in 1799. In the partnership of Woodcock & Byrnes with Bancroft Woodcock 1790-1793.